After the Earth became devastated by pollution and other disasters, humans started building space colonies. The majority of human beings were born in space since then. But their health was much worse than the health of average human being born on the Earth before. Scientists have developed a unique technology on the second oldest space colony, named T2 (oddly enough, just like the Japanese company who made this game). But something went terribly wrong, and soon the scientists realized that they were killing human beings with the new technology. The project leader was killed, and a man named Nakajima took the power into his own hands, intending to continue the experiment for his own destructive purposes. One of the scientists contacted then a young female hunter, a special agent trained in armed combat, to help him track down the bad guys and to stop the experiment. 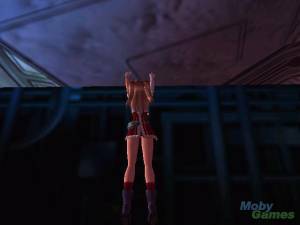 Binyu Hunter is a shooter in which the player controls the young heroine, her back always turned to the player, moving her horizontally, shooting enemies with the left mouse button and reloading with the right. 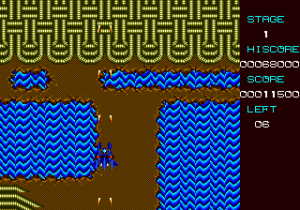 Double-tapping left and right arrow keys results in the heroine diving and jumping to the side. There is a variety of enemies to deal with, from stationary regular soldiers to snipers, grenade-tossing enemies, enemies with protective shields, bosses with special techniques, etc. 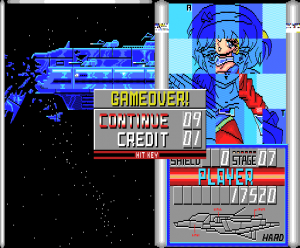 Each stage typically consists of many enemy waves coming in different patterns and with increasing difficulty.